You guys have to try grilling potatoes! I don't know how this idea escaped me all these years, but I'm in love and make them all the time now. I needed a side to go with the steaks with cilantro chimichurri and I wanted to grill it. I had red potatoes on hand and a light bulb went off. Having never done this before, I did a little Googling, kept the recipe simple and hoped for the best. The crunchy potatoes were my favorite, but the skin on each potato has a nice crispness in contrast to the tender centers. Some of the grill flavor comes out in the potatoes too. COOK'S NOTE: I've been using salt, pepper and chili powder for seasoning, but use whatever strikes your fancy. Preheat the grill. Coat potato slices with olive oil and seasonings. Grill the potatoes in a single layer for about 5 minutes on each side or until potatoes are golden and cooked through. After removing them from the grill, taste and sprinkle with a touch more salt if needed. These can be served with a dipping sauce, but they are pretty tasty one their own. Don't you love when you can cook most of your dinner on the grill? With the exception of the tomato salad, I did just that with this meal. I grilled some ribeye steaks and thinly sliced red potatoes and we were good to go. Traditional chimichurri is made with parsley, but when I saw this steak with cilantro chimichurri recipe I knew I would actually make it. I already had cilantro in the fridge and ribeyes were on sale. This dinner was fabulous! I don't usually cover up a steak, but the cilantro chimichurri gave it something a little extra. I love the slight heat that comes from the raw garlic in the sauce. I didn't bother mincing the cilantro and garlic. I just threw all the chimichurri ingredients into my mini chopper/food processor to do all the work for the sauce. The leftover steak and chimichurri made excellent tacos the next day. I added the chimichurri to sour cream to stretch it since there wasn't much left. Heat grill to high heat. Allow meat to come to room temperature and rub the seasonings onto the steaks. Grill over high heat until desired doneness. In a separate bowl, add cilantro, garlic, oil, salt and pepper. Stir to combine. Every Saturday Western Reserve Wines has a wine tasting from 2-5pm. We were there last weekend which was the same day as the Kentucky Derby. 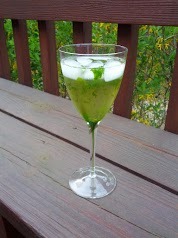 In addition to the tasting lineup, Kathi made a wine mint julep for all to try. She heard about this drink through a wine distributor and thought it would be fun since it was Derby Day. I liked this version of mint julep better than the traditional bourbon and simple syrup. These wine mint juleps were light and refreshing. A great summer cocktail if you're looking to mix it up. 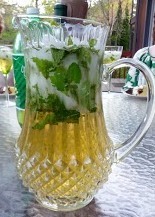 In the bottom of the glass or pitcher (depending on how much you're making) muddle the mint with a wooden spoon. Fill the container halfway with ice, then add equal parts sauvignon blanc and ginger ale. Garnish each serving with a small sprig of mint. What did I do when I bought a bunch of perfectly good lemons in the "Sell Now - Reduced Price" produce pile? Well, I didn't make lemonade! I made lemon gelato (or lemon ice cream, whatever you want to call it). I used six lemons for this recipe and the rest went into various cocktails or cucumber lemon waters. You guys! I think this might be my favorite ice cream I've ever made! No joke. If you like lemon, you must try this. It's full of sweet, tart, creamy goodness. My favorite time to eat it was after it had been in the freezer for only a couple hours and it wasn't totally hard yet. Don't worry though, it's still amazing once it's completely frozen. It's also good with fresh strawberries on top. PS You don't need a gelato maker, any ice cream maker will do. **If you don't keep your ice cream maker bowl in the freezer, put it in the freezer the day before so it's completely frozen. Whisk the egg yolks and heavy cream together in a bowl and set aside. In a large sauce pan, add the half and half, lemon zest and sugar. Cook over medium heat stirring frequently until sugar dissolves. Remove from heat. Add some of the warm half and half mixture to the egg yolk mixture to temper the egg mixture. Gradually add the egg yolk mixture into the half and half mixture and stir well to combine. Return to medium heat and cook until mixture thickens. Remove from heat stir in vanilla extract. Allow pan to cool slightly then cover with wrap and place into the fridge to cool completely. When you’re ready to make the gelato, stir in the lemon juice and follow instructions on your gelato/ice cream maker. I don't cook fish very often, but fresh halibut was on sale a few weeks ago and then swordfish the week after and I couldn't resist. I've never cooked swordfish myself, but it turned out really well. The fish was beautiful to begin with and this preparation is fairly simple. I cooked it in a skillet with a little oil, then topped it with tomatoes, capers and a balsamic brown butter sauce. It was amazing! The dish was sweet and savory and I loved the texture of the swordfish steak (it's more firm than your typical fish). Everything came together quickly too. I definitely recommend picking up some swordfish if you see it on sale at a reputable fish market. Cook's Note: I only cooked 3 steaks, but made the full sauce recipe. The extra sauce was delicious on mushroom ravioli the next day. Simmer butter in heavy medium saucepan over medium heat until deep golden brown, swirling pan occasionally, about 6 minutes. Remove from heat. Whisk in vinegar, honey and mustard. Season sauce with salt and pepper to taste. Brush fish with oil and sprinkle with salt and pepper. Heat heavy large skillet over medium-high heat. Add 3 swordfish steaks. Saute just until opaque in center, about 4 minutes per side. Transfer to plates and tent loosely with foil to keep warm. Repeat with remaining fish. Whisk sauce over low heat to rewarm if necessary. Spoon sauce over fish. Sprinkle with capers and tomatoes. Last year I talked about Bakin' Bacon and how it's the cleaner and quicker method to cook bacon for a crowd. Well I tested this theory with sausage patties as well, and it worked great. I love not having to clean grease splatter from my stovetop! The method is easy, I started with a hot oven and finished them off in the broiler to get them brown and crispy. Preheat the oven to 425 F. Line a baking sheet with foil and arrange the patties on the sheet so they are not touching each other (use a second sheet pan if needed). Bake the sausage for 10 minutes, then flip each patty and rotate the baking sheet back to front. Bake for 10 more minutes, then broil for 3-4 minutes until the sausage is browned to your preference. Spaghetti and Meatball Pie?! I loved this dinner, it's such a fun form of spaghetti and meatballs. It was a little more work than slapping noodles on a plate and covering with sauce, but not much (especially if you buy the meatballs like I did). I'm normally not a fan of spaghetti and meatballs (see other confessions here), but I loved the flavors and textures from this variation. The creamy cheese and the noodle crust really did it for me. I used pre-made meatballs and doubled the recipe to make two pies. I'm really glad I doubled it because it was really tasty and having an extra dinner in the freezer is convenient. Doubling also made measuring a bit easier for using a full containers: a whole box of noodles, 16 oz can of tomatoes (I haven't seen 8 oz cans), full 1 lb container of cheese, etc. Cook's Note: My pie took almost an hour to bake before the middle was warm. 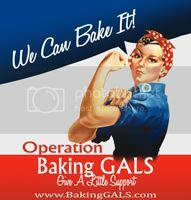 All ovens are different and the temperauture of the ingredients will make a difference if you do some steps ahead of time. To check the temperature, poke a knife into the middle of the pie (going down to the bottom) and put it to you lips. If it's still cool, continue cooking until it's warm enough. Combine all ingredients and roll into golfball sized meatballs. Brown on all sides and set aside. Cook spaghetti noodles. Drain. Stir butter into hot noodles until melted. Stir in Parmesan cheese and eggs. Form pasta mixture into a crust shape in a buttered 9-inch pie plate. In skillet, cook ground beef and onions, bell pepper and mushrooms until meat is browned. Drain. Add to meat mixture, tomatoes, zucchini, tomato paste, oregano and garlic. Heat through. Spread cottage cheese over bottom of spaghetti crust. Top with tomato/meat mixture. Cut the meatballs in half and arrange on top. Sprinkle grated cheese over all. Lightly cover pan with foil and bake for 25-30 minutes at 350 degrees. Remove foil and bake for 5-10 more minutes until cheese is lightly browned. Cut into pie wedges and serve. Freezer Instructions: You can also prepare this dish ahead of time and freeze for later. If you want to go this route, cover the pie pan with foil right after assembly; label and freeze. When you are ready to serve: Thaw, bake covered for 25 minutes at 350 F. Remove foil and bake for 5 minutes more until cheese is lightly browned.